Main purpose of these classes- is to be added as components to GameObjects, thus hooking these GameObjects to table's rows. 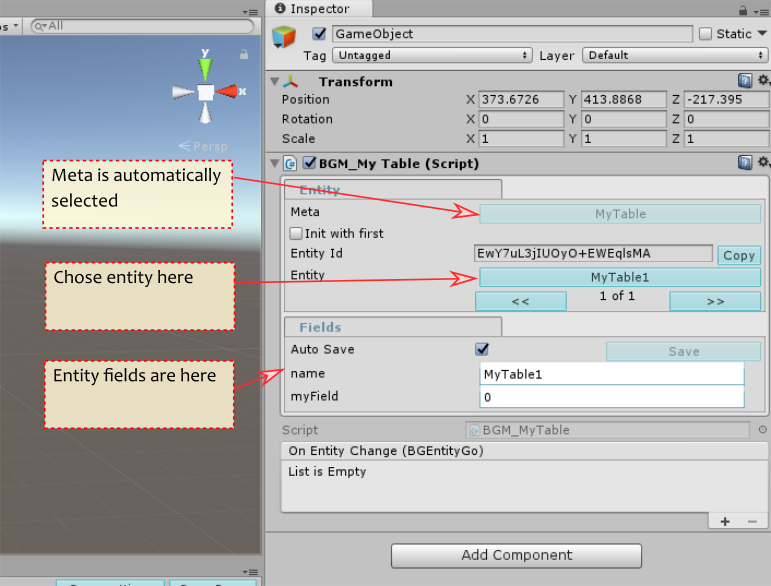 Without these classes you would use generic BGEntityGo component to hook up GameObject to database. So, what is the difference between BGEntityGo and generated class? Additionally, you can chose to use classes, generated by ExtensionClasses generator, so you can easily navigate by relational fields. More information about it below. Question: why bother to use those classes? Answer: because of relational fields. There are 3 fields in BGDatabase, that are relations (relationSingle,relationMultiple and nested). As a value they return the reference(s) to another row(s) (BGEntity). Here is the simple example: Table1 has a relationSingle field called Relation, that points to a row from Table2. That is certainly not what we want. So using ExtensionClasses makes relational value to be casted to be the type, generated by ExtensionClasses , e.g.